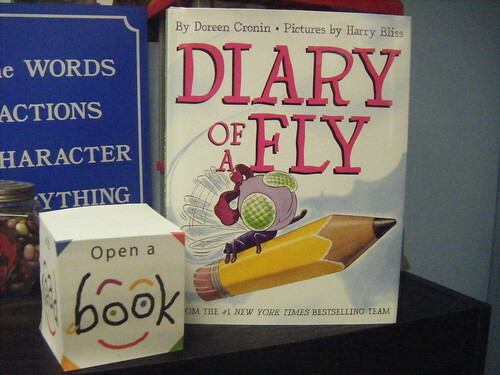 The students in Mrs. Carline's grade 1 class at Cozy Lake School recently completed an author study of Doreen Cronin. Ms. Cronin wrote the Farmer Brown books Click Clack Moo, Giggle Giggle Quack and Dooby Dooby Moo. She also wrote The Diary of a Spider, The Diary of a Worm and The Diary of a Fly. During the author study the lass discussed character point of view and personification. After reading many of Ms. Cronins books, they wrote letters to Farmer Brown as well as diaries of their favorite animals. The culminating activity was a SKYPE video conference with Ms. Cronin. She read the class Click Clack Moo. After reading the story Ms. Cronin answered questions that the students had developed. The students asked her about how she works with the illustrator, where she gets her ideas for writing, where she writes her books, what is the process she follows when writing a book, and other questions about her character choices. It was an amazing and educational experience for the students. I have shared to videos of the event in this posting below. By providing access to authors using video conferencing we can engage students in the writing process. An authentic learning experience like this allows students to make connections between the process an author follows and the writing process they are learning in the classroom. Below are Part 1 and Part 2 of our Video Conference. Enjoy!